If algorithms are the gamechanger affecting all industries, communicators need to learn how the game is played, and what are the new reputational challenges involved. Whenever artificial intelligence and algorithms are the topic of conversation among communicators, the focus is usually on how these technologies will take over tactical activities – think of automated reporting, chat bots or big data analytics. This article is not about that. Rather, it is about the revolutionary shifts that these technologies bring to organisations as a whole, and how these shifts create new challenges for communicators. It is about understanding the ways in which these technologies reshape how organisations engage with their stakeholders. Increasingly, operations, choices and decisions that not long ago fell under the control of human actors are at least partially delegated to computerised algorithms. These systems outperform humans in identifying important relationship patterns across vast and distributed datasets, and have already become instrumental in, for example, online shopping, equity trading, hiring and promotion, or even recommending medical treatments to physicians or sentencing to judges. However, these systems can and do fail. They may reinforce social inequality, encroach on consumer privacy, unethically influence stock and commodity exchange or even election outcomes. In response, there is growing public unease about these technologies and their social ramifications, paired with increasing calls for more transparency. Public concerns about algorithms are central not only for their creators but also for the rapidly growing number of organisations that employ them. As more and more people interact on a constant basis with algorithms, the public perception of organisations increasingly depends upon them. Algorithms not only represent and shape user experiences of the organisation that owns them, but also affect the reputations of organisations that rely on third-party algorithms as part of their value chain. As many organisations interconnect with the influential algorithms of Amazon, Google, Facebook and the like, their reputations also partly depend upon the algorithmic activities of these large players. Broadly speaking, algorithms are “encoded procedures for transforming input data into a desired output, based on specified calculations”1. As such, algorithms can, in principle, be performed by humans and can be found in any culture with mathematical procedures. However, as performed by computerised systems, they have quickly proliferated as rational means of everyday decision-making. Within the last two decades, algorithmic decision-making has been popularised by, for example, Amazon’s product recommendations, Google’s search results and Facebook’s timeline algorithm. Initially the debate about algorithms focused mostly on ‘soft’ decisions, such as the question of how algorithmised recommendations might change the book market or how a ‘filter bubble’ might alter public discourse in the very long run. decision-making is no longer a topic for technicians and specialists. Algorithms and the proliferation of machine-based decisions are quickly reshaping countless spheres of life. Evidence concerns can surface on three levels. First, decision-making algorithms can be criticised because they may give inconclusive evidence by producing probable outcomes. Their calculations allow for “best guesses” based on probabilities but never for certain results. Second, these algorithms may give inscrutable evidence when knowledge about input data and their use is limited. Finally, they may give misguided evidence when their conclusions rely on inadequate inputs, in other words “garbage in, garbage out”. Evidence concerns became a highly apparent issue in, for example, PAS which are used to project the success of medical treatment and the likelihood of patients’ deaths. 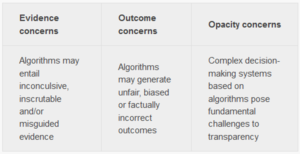 Both evidence and outcome concerns are common but not necessarily linked to complex algorithmic decision-making systems based on algorithms. However, the third set, opacity concerns, are qualitatively different in this regard. They arise in the context of nearly all complex decision-making systems as they remain – at least in part – opaque. And this is not just about companies actively keeping them secret in order to protect their competitive advantage. The fluidity of these systems makes it excessively difficult, and in some cases even impossible, to detect problems and identify causes even if organisations grant access. Why is that the case? This holds especially true for machine learning algorithms, which are in large part shaped by the training data they use, but also for digital data in general, as “Data have no value or meaning in isolation. All parts of the infrastructure are in flux (…)”. 5Opacity is thus not only a result of technical complexity, but also of the fact that, in practice, these technologies are not simply reducible to their parts. The proliferation of algorithms in organisations brings about a new set of concerns with organisational conduct that communications leaders must address. Addressing these concerns effectively demands a basic understanding of the general workings of algorithmised systems and how these come to shape different kinds of reputational concerns that will inevitably emerge around these technologies, posing new challenges to be tackled by communicators. A key reputational concern here is algorithmic opacity and the challenges it poses to communicators regarding the safeguarding of organisational accountability; i.e. how can communicators manage accountability when their organisations introduce more and more systems that are essentially “black boxes”, and perceived as only poorly transparent and “creepy” technology. In the next part of this article, we will discuss elements of communication strategy that help to deal with this new and intricate challenge in the age of algorithmisation.